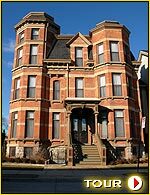 Now an elegant bed and breakfast this former 19th Century mansion, The Inn at 97 Winder, in Detroit's south Brush Park is emblematic of the promising transformations taking place in a neighborhood that once seemed hopelessly doomed. New Red Wings Arena behind Fox Closer to Reality? When did your family leave Detroit? 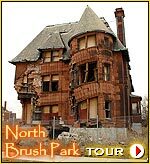 Brush Park originally was the site of 19th Century 'gilded age' mansions. When the city grew rapidly in the first decades of the 20th Century the mansions were carved up into rooming houses, often with wings added to their rears. By the late 20th Century Brush Park was an area of abandoned structures, overgrown by vegetation and infamous for open drug transactions and prostitution. 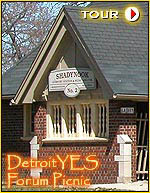 At the turn of the 21st Century, spurred the the redevelopment of downtown the nearby new Detroit Tigers baseball park, a rapid redevelopment of south Brush Park, led by Crosswinds Development, filled a hidden demand for livable downtown residences. That success is now fueling the redevelopment of the north Brush Park where several ruined residences offer exciting opportunities. Free Modati / Reform Clothes Party!